Already a member, THANK YOU! Click on the Member Login menu to find all the premium content. In August we were on the road. See our August Photo album. First an RV rally in Syracuse, NY. Then a visit with friends on the New Jersey shore. And, finally, a stay at a winery in South Carolina in order to view the total solar eclipse. It was perfect. The stars came out. The clouds stayed clear. The corona was wispy strands of silk. The diamond ring blazed brightly coming out the other side. And, yes, I cried. I think Jim did too. After the eclipse, we came home to Fort Lauderdale, Florida. As I write this we are preparing to evacuate from the path of Hurricane Irma. .. this might be a short newsletter! We will post updates on our Website on where we are. Check out webcams to watch the hurricane from a distance – the only way. We record them in a live stream on Sunday at 2pm ET. S7 Photo Backup – scroll down, it’s long. The eclipse is a work of art, with a little help from an app! 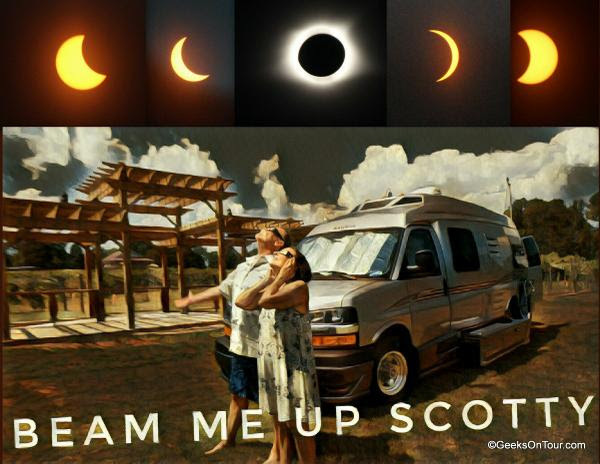 We took a lot of photos at the total solar eclipse. It was a dramatic sight. Then we had lots of fun editing the resulting pictures, making collages and using this special app to turn the photos into a work of art! We love the Blogging platform from Google called Blogger.com. We’ve been keeping our personal travel blog on it since 2003. This is what we teach at RV rallies in the seminar, “Every RVer needs a blog.” And, it is the subject of one of our more popular tutorial video series. We taught it again just this month in Episode 123 of What Does This Button Do. I have a beautiful photo of a waterfall in Pennsylvania. It’s in my Google Photos library. I took it with my Canon camera. How can I use it as the wallpaper for my iPhone (or Android) phone, when wallpaper photos need to be on your device’s camera roll? We’re updating the website all the time. There are nearly 1,000 articles, 500 videos, and 120 What Does this Button Do Episodes. How do you find what you want? Here are some tips on how to get to the best stuff!